Ah, it's finally QUIET! I can think for a minute to post. My name is Carlotta Pengelley, and I am the owner of Carlotta's Celebration Creations. I am a jewelry designer and creator, bookbinder and altered book artist, mixed media artist, and I dabble in lots of other media. 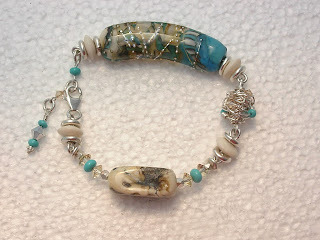 My favorite jewelry items include using gemstones, metals, wire, and Artist lampworked beads. It's well known among the people who are acquainted with our family that I make jewelry. "It must be so nice, now that your children are older," commented one typically unenlightened person, "you must be able to get so much more jewelry made with them to take care of themselves." Suffice it to say that none of my 3 kids drive, the 20 year old works part time and so I drive him, the 16 year old girl is in summer school and softball and I drive her, the 17 year old- well, I wish he had a job. I would gladly drive him. Instead he is home for summer break with his friends coming by to play Metal Gear 4 and Grand Theft Auto VERY LOUDLY until 1 AM, with the blessing of Dad who said at least they are here and not out on the street. A few more weeks of this and someone will be on the street. So, with the major gathering of fine Teen Male Testosterone and the rising decibel level in the main room of my home, I did what every sane woman and frightened animal does- retreated to the quiet of my personal lair. In my case, I took my box of bags of smaller bags of stones with me. For the past few years I have stored my beautiful gemstones in little baggies in a plastic bag. When that bag filled I started another. And another. Then I had to start storing those in a box. This system proves inconvenient in many ways. And so while I continue to inventory all of my supplies into a jewelry making program, I have started to store my gemstones in individual little translucent boses that store in stackable translucent containers. 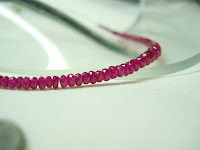 Not only did I find this activity to be very relaxing for me today, but it helped me come up with a few new gemstone combinations; some of which you will see in the next few weeks in my jewelry store. I admit, it did not help me fill my Etsy store or do anything to photograph or add descriptions to listings ready to be uploaded, but we all need some way to relax once in awhile. And organization does, however indirectly, help in the creative process. And for me, every little bit helps. Besides, it got my blog homework done for tonight. Nice blog but I am unfamiliar with this word "organize." Of what do you speak??? Nice post Carolotta. I can relate to having teenagers around. It is nice having a place to retreat to, where we can lose ourselves in our beads and gemstones! Even if it's just to move them around and organize them! Hi Carlotta, I can't believe how much we have in common. I have 3 sons, ages 16, 18 and 22. I alternate between being a chauffeur, personal atm machine and neighborhood activities coordinator! But they are good kids, and I'm happy to do it. At the same time I just rearranged my house and moved a desk into the family room for my jewelry making. I too am moving all my stones into individual acrylic boxes. I love being able to see them so clearly. I can take them out and try different combinations without making a big mess. I look forward to getting to know you and all the other fabulous women/artists on our street team! Hahaha Carlotta - I can so associate with your need to be organised and we also call this 'sharpening our pencils' in this household - work that makes you feel better but puts off that work that really HAS to be done. I regularly go through and move things around although I now have so much stock that it HAS to go into plastic bags in boxes as all my storage solutions keep getting outgrown!! I have a client coming over in a day or two - arrrggghhh - must ORGANISE - LOL.